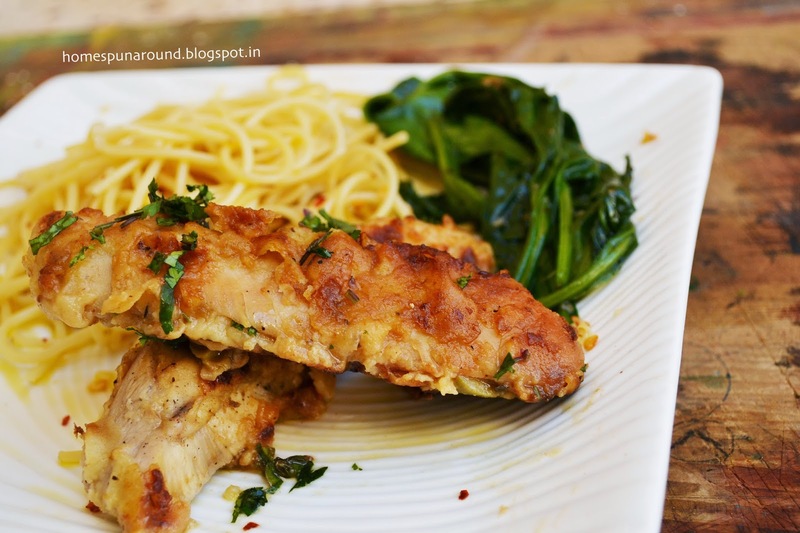 Home-Spun-Around: Tasty Tuesday: Lemon Chicken Piccata with olives. 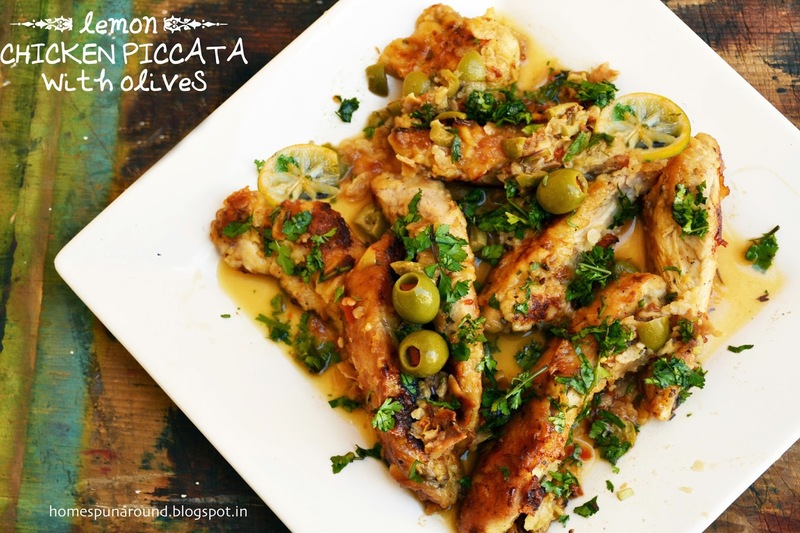 Tasty Tuesday: Lemon Chicken Piccata with olives. 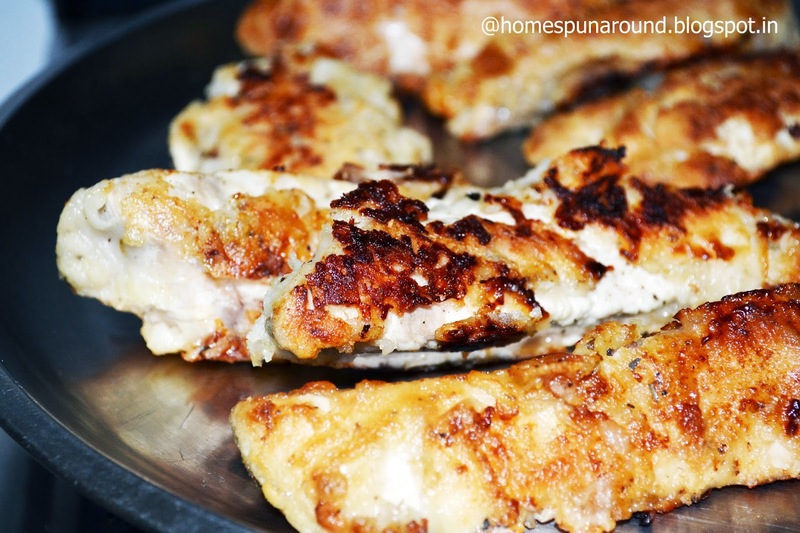 I love how one can do a lot with chicken breasts, though I agree with the fact that most of the flavor lies with chicken-in-bones, but the versatility of working with chicken breasts is just great! Or have a yummy and healthy ("baked" General Tso's Chicken)! This particular dish that I am sharing the recipe of is supposed to be Italian,and I had it once in New York and fell in love with it! I had wanted to try it once I got back home but unfortunately its cooked with capers and there is absolutely no chance in hell of getting capers here! But I looked for a substitution of capers and viola- one can use olives too!! 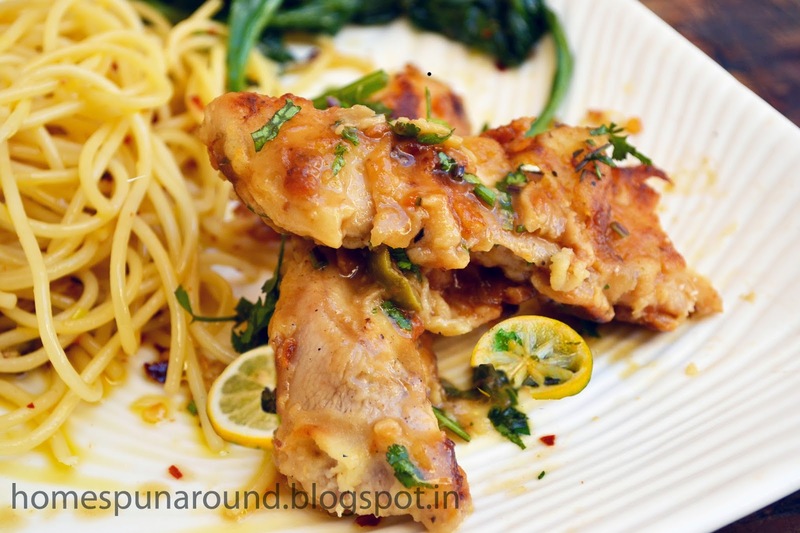 The tangy lemony flavors of this dish just burst in your mouth! 1- Take the chicken breasts and if thick then flatten them by lightly pounding them. Cut them length wise but please do not make them too thin and finger-like. 2- season the chicken with salt and pepper. 3- Dredge them or roll them in all purpose flour, and shake of the excess. 4- Heat half the oil with half the butter on medium heat. When it starts to sizzle, add a couple of chicken pieces and fry for 3-4 minutes till golden brown on one side. Then flip and brown the chicken on the other side. When done, remove from the pan and keep aside on a plate. Add some more oil and butter and fry the other chicken pieces in the same way. They should all be golden brown not blackish brown. 5- Once all the chicken is fried, do not remove or wash the pan...lower the heat and add the chicken stock and the lemon juice to the same pan. Bring to a boil and keep scraping the brown bits of flour and chicken at the bottom of the pan, and mashing them in the bubbling sauce. Check for seasoning and add more salt if required. 6- Add the chopped olives, and allow the sauce to bubble and thicken and reduce slightly in quantity. 7- Now add the chicken pieces to the pan with the sauce and simmer for a couple of minutes. 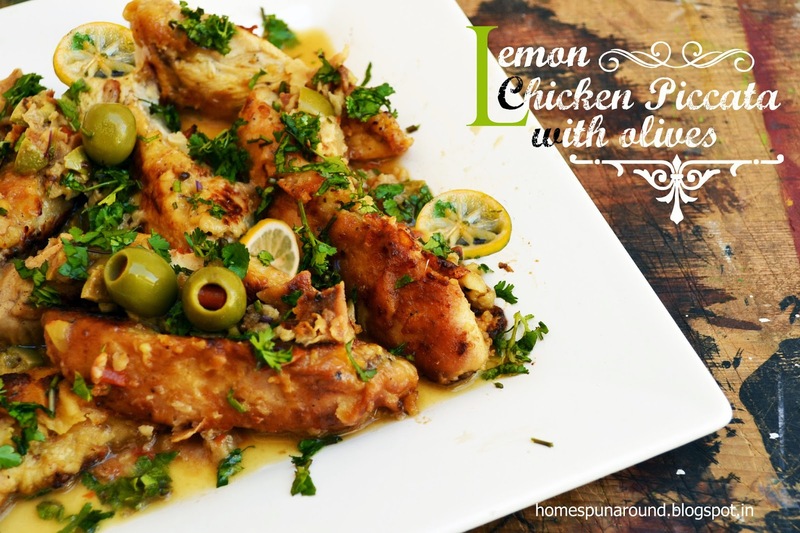 9- Pour this sauce over the chicken, garnish with lemon slices, olives, and chopped parsley. (Another variation (from the Pioneer Woman blog) of this Chicken Piccata is adding about 3/4th cup heavy cream to the sauce just when you are done with the boiling and simmering of the sauce.